It is that time of year again! Time to go pumpkin picking, carve your jack-o-lantern, buy the kids' their Halloween costumes, and bake some tasty Halloween treats. 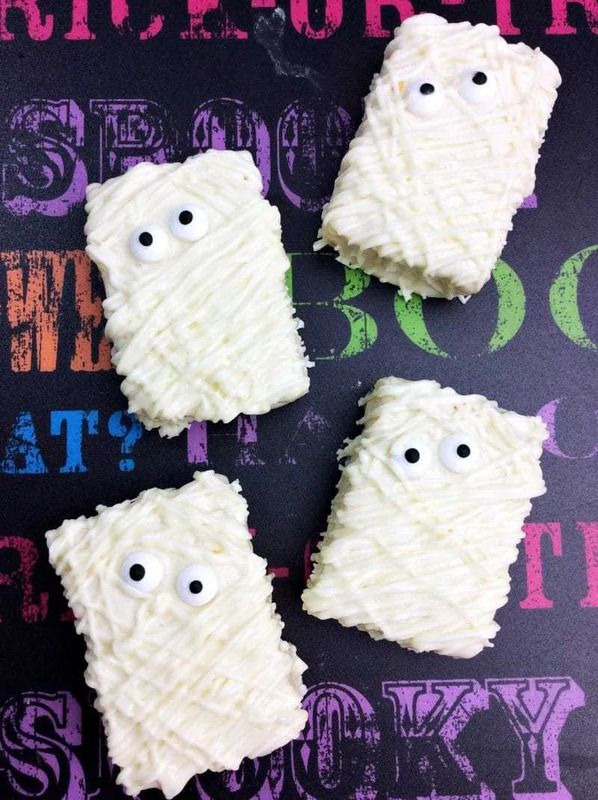 Today I want to share these mummy Rice Krispie Treats with you. If you are looking for a quick and easy Halloween dessert recipe, you are in luck. Links to purchase the necessary products on Amazon are included below for your convenience, but the supplies can also be purchased in most grocery stores. Once you have everything that you need, these adorable Halloween treats will come together in no time. We used pre-made Rice Krispies Treats for this recipe, just to make it easier. Of course you can feel free to make your Rice Krispies Treats from scratch instead. Get the kids involved by having them help decorate and place the eyes on the treats. 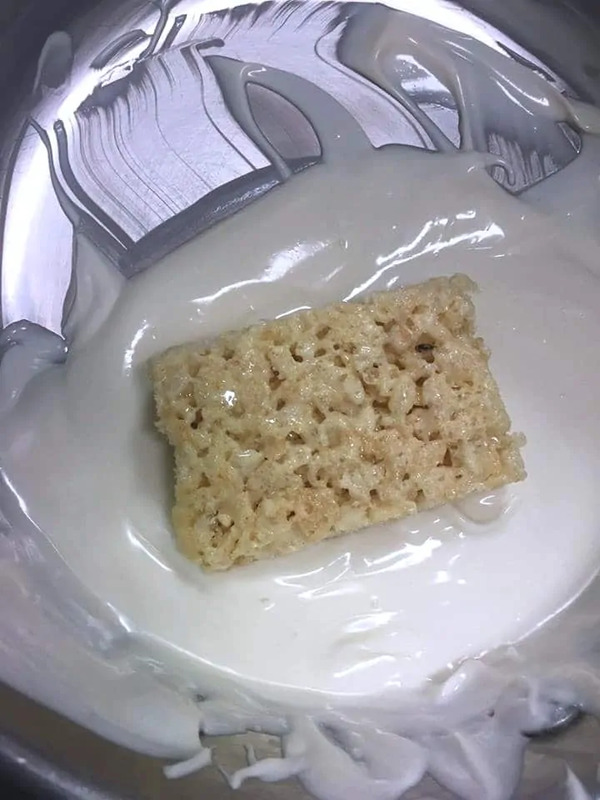 So let's take a look at what you need to make these mummy Rice Krispies Treats and then go through the process step by step. A printable version of the recipe is located at the bottom of this post for your convenience. Unwrap Rice Krispies Treats and place on cookie sheet. Set aside. Melt chocolate and fully coat Rice Krispies Treats. Place 2 eyes onto each Rice Krispies Treat. Next, place Rice Krispies Treats onto cookie sheet and then in the refrigerator to harden (about 10 minutes). Scoop the remainder of the melted chocolate into piping bag. Cut off the tip of the piping bag so that it will make small lines of white chocolate. Remove the Rice Krispies Treats from refrigerator. 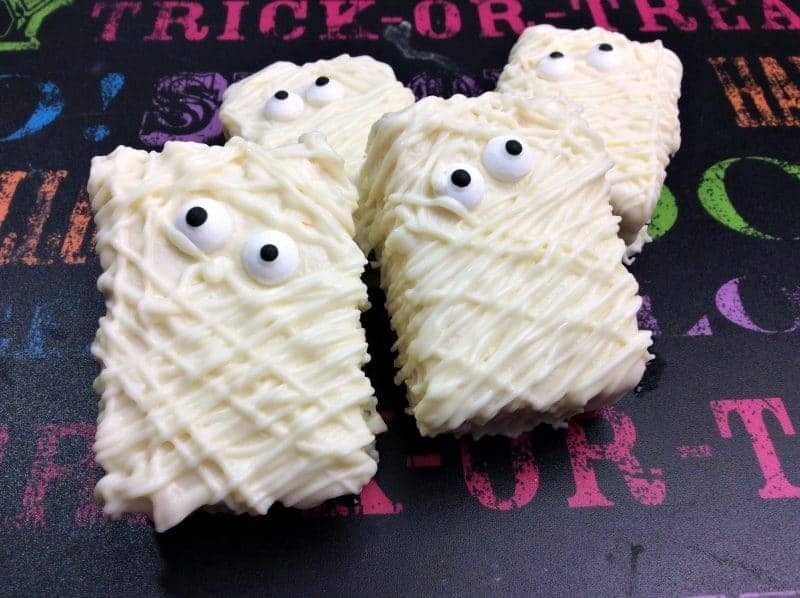 Using the piping bag, drizzle white chocolate over them back and forth for a mummy effect. Let sit for a final 30 minutes to harden before serving. Enjoy and have a Happy Halloween! Be sure to check out our Brownie Bite Spider Treats, Ghost Doughnuts, Spiderweb Cupcakes, and Bloodshot Monster Eyeball Doughnuts if you are looking for more Halloween dessert ideas. 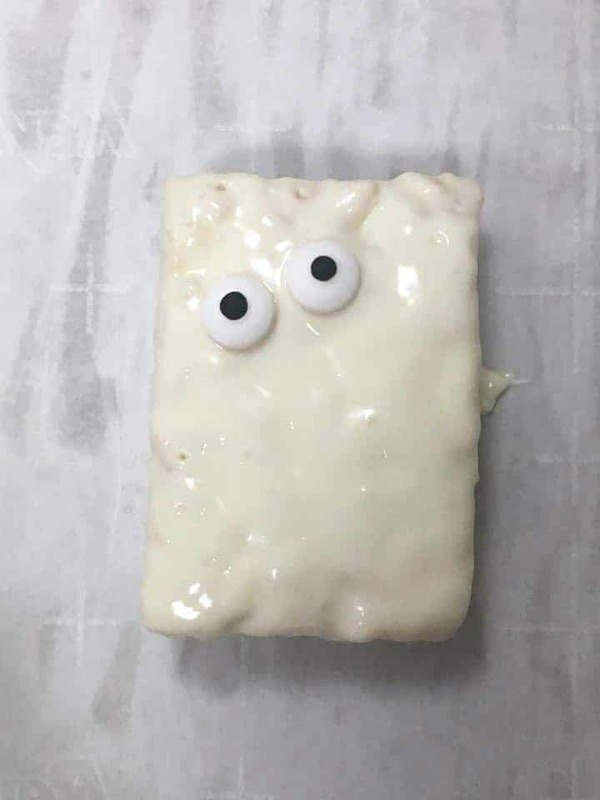 Place 2 eyes onto each Rice Krispies Treats. Place Rice Krispies Treats onto cookie sheet and place in the refrigerator to harden (about 10 minutes). Let sit for a final 30 minutes to harden before enjoying. Oh yum! These would be so much fun for Halloween! I am going to have to give these a shot. These treats look great, they are very cute. They would be perfect for a kids party or club gathering as Halloween approaches. First of all these sound delicious! I think white chocolate and rice krispy treats would go together really well. I also love the cute Halloween factor. My kids would really enjoy trying these. These are the most adorable spooky mummy treats ever! I love them and must make them. The kids just gobbled up our rice krispies, so going to have to buy more! Ahhh! Those are so awesome! They look perfectly Halloween-y, and I can’t think of anything tastier than Rice Krispies Treats covered in white chocolate. Yummo! 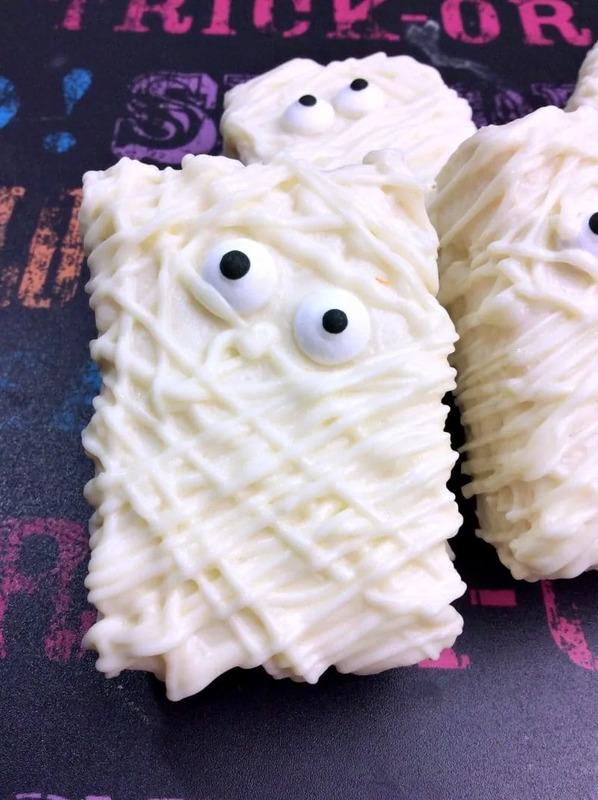 We love making these Rice Krispie Mummies at our house! We put them on a lollipop sticks to make them even more portable! 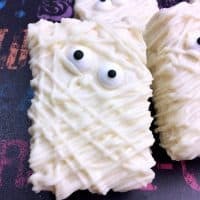 Such a fun and easy treat!